Why mass produced lampwork beads are bad for your jewelry business! Like many industries, artistans, including lampworkers, have had to deal with the flooding of our national markets with cheap imports. In the United States, it's kind of beaten into us from a young age that our "great capitalism" will serve the consumer as competition forces cheaper goods to be produced. But when that competition comes from overseas, the door is opened to hurt local economies *and* introduce inferior goods to the market. This post will deal with the latter (the former is a whole 'nother post in itself) and, even then, only under a very specific lens. 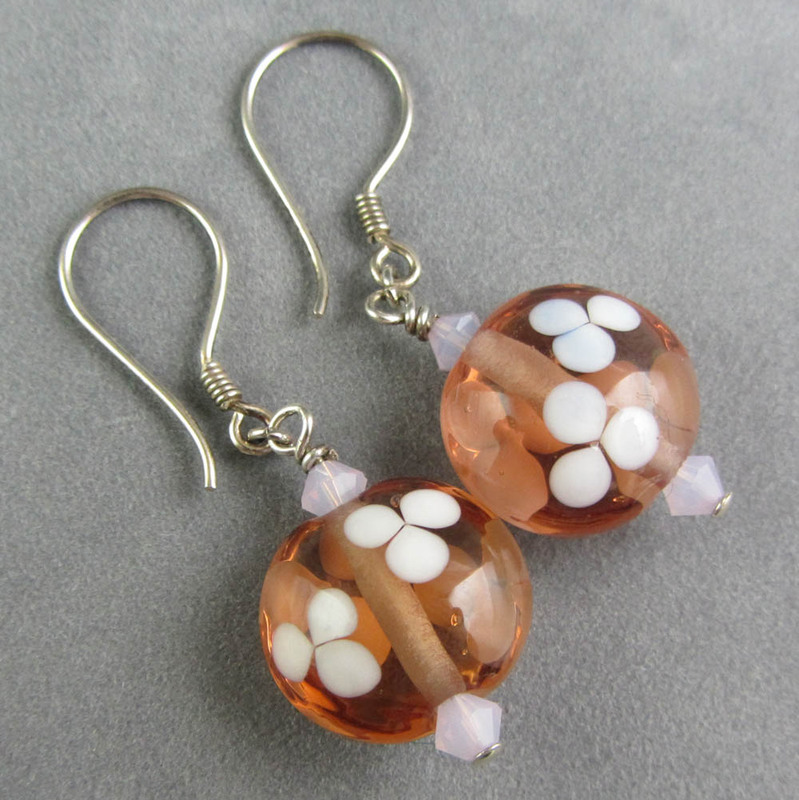 Jewelry artists: have you ever wondered why artisan quality lampwork is so much more than the cheap, and admittedly sometimes cute, strands you find at the bead stores and shows? Yep. Broken beads right on the shelf. I apologize for the poor quality of the photo, but it was part of a highly covert operation. Most stores do not like it when you take photos of broken merchandise. It makes it look, well, cheap. 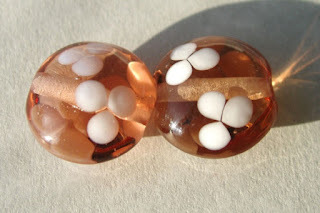 The most likely reason for a broken lampwork bead is usually that it wasn't made properly to begin with. 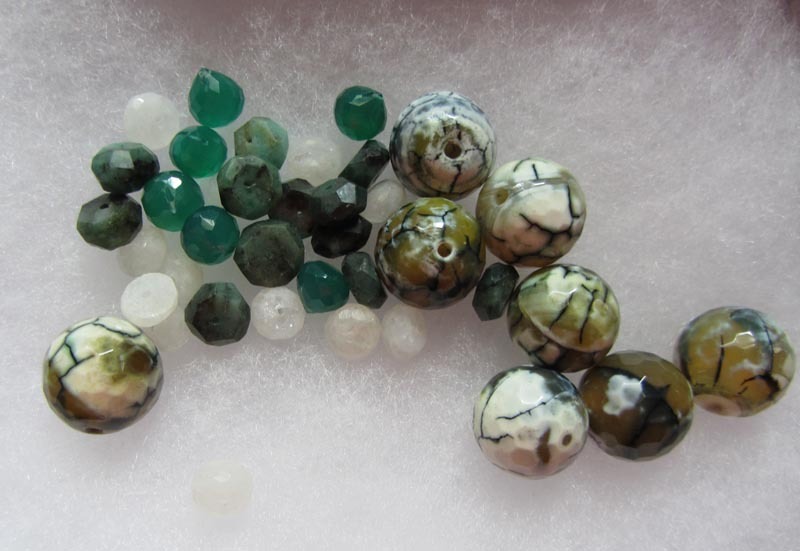 While some round or thicker beads can withstand the test of time without being annealed, today's fancy beads, *especially* flattened ones MUST be annealed. And the annealing must be in a kiln to be done properly. And that costs a lot of money. Money which the factories will not spend (because then prices will have to increase). They may try to get by with flame annealing or using fiber blankets to protect somewhat against thermal shock, but the beads will not be annealed. Now, ask yourself: do you want to use beads that may break on the strand for no reason? 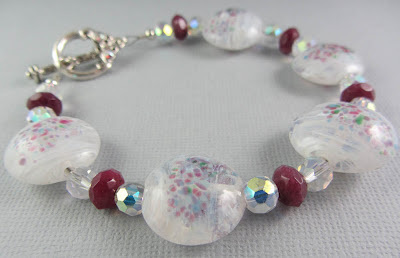 Do you think your customers will appreciate it if they go to put on a bracelet you made and one of the pretty glass beads splits in two and falls off? 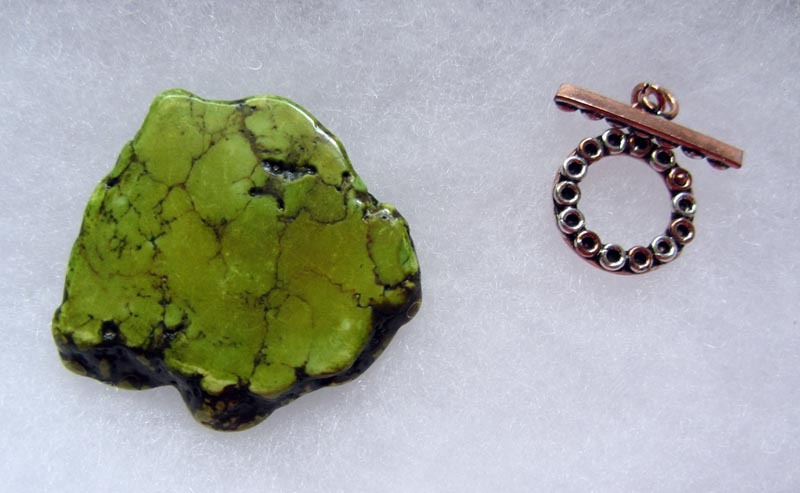 That is why it is good practice as a jewelry artist to use quality handmade materials. It's not an issue of snobbery, or being an elitist over materials. It's good business sense to make products that are beautiful *and* stand up to everyday use. I know there are other components in the jewelry field that should be looked at closely when trying to decide if that "good deal" is really good for your business. I would be interested in hearing from other artists, especially if they make components, on how some of the imports may not be up to snuff quality-wise. I understand this can be a sensitive discussion, so if you would feel more comfortable emailing me your comments, which I will post under my name, or leaving your comment as "anonymous", that is totally understandable. I really just want to hear what people have to say! 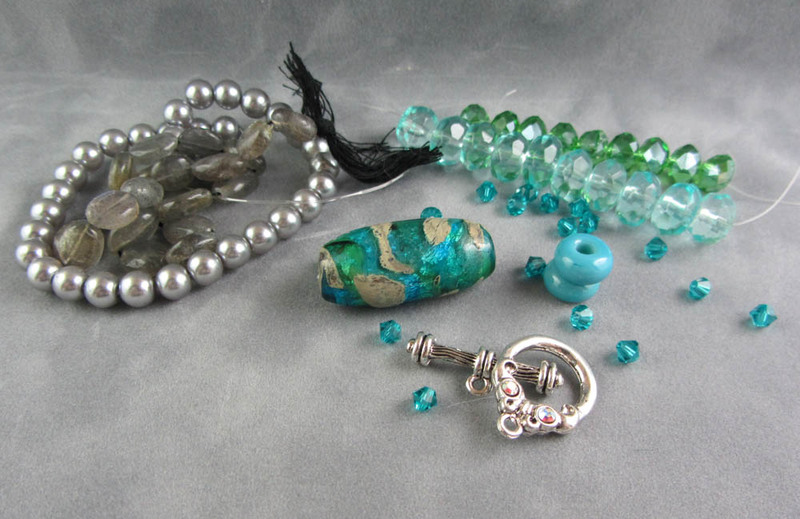 Bead Soup Blog Hop First Reveal!! Today is the first reveal for some members of the ginormous Bead Soup Blog Hop. Even though my pieces are not part of this first reveal, I wanted to direct people to check out the fabolous creations of my fellow artists. I figure, if you found you way to my blog, it means you like handmade jewelry and beads--and you will not be disappointed if you spend some time blog hopping today! 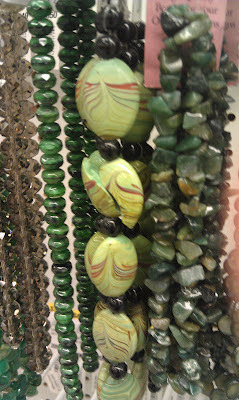 Click on the photo below to be taken to the Bead Soup Blog Hop page, where you can click away to your heart's content! Some More New Lampwork Beauties! Well, I think they're beautiful! Click on the picture to go to the listing! I also made a necklace with some of my handmade "fire opal" beads. 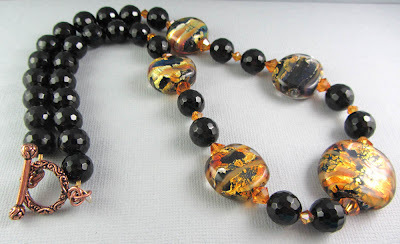 The term "fire opal" comes from Amber Ballard (http://www.etsy.com/shop/Na0sGlass), who shared her technique for creating cool effects with silver foil and certain special glass. I love making these beads, as each one is truly unique, so many thanks to Amber for sharing her knowledge! Holy Cannoli! It's some NEW WORK! I finally have a new piece to show! Well, I have a few, but I am going to show you one for this post! 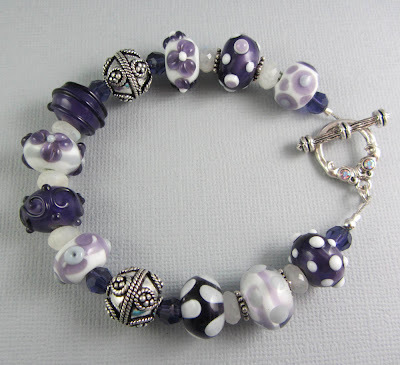 This bracelet is beautiful, especially if you love purple, like I do. What's even more interesting about this bracelet is that is almost got flung against the wall three, maybe four, times. I first strung and crimped the bracelet about a week ago. I realized it was way too short. Usually I use a bead board, and can eyeball measurements that way, but my bead board is so covered with beads that I can't use it for it's intended purpose. It's tough being a jewelry artist. So I clipped the bracelet, and re-started. I decided to add some moonstone rondelles, to fill it out a bit. Apparently, I measured wrong *again* because it was still too short. As in, it might fit a small child under 5. 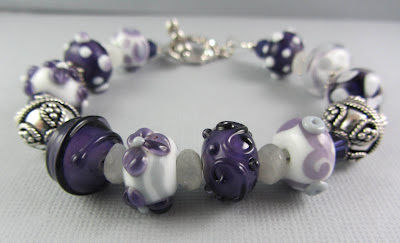 I had so many lampwork beads in this bracelet, I forgot to take into consideration how they affect the wearability, due to their circumference. So I pulled off most of the beads AGAIN, to add the silver plated bali-style beads. I also decided to use one of my toggles with the Swarovski crystals, which was larger than the first, so that helped. I completed the bracelet, added the toggle and was so happy with the results! And then I realized the tiny 3mm silver bead didn't make it's way on to the end. In fact, that bead may be residing under a piece of furniture, as it's missing and my cat looks strangely guilty. So, instead of restringing the bracelet yet again, I took a deep breath, and decided to offer an almost perfect purple lampwork bracelet. It's $10 less than what it should be, to make up for the slight imperfection, which most people wouldn't notice (but if you're like me, it may drive you slowly insane). And it's in my Etsy shop, waiting for a new home. I've been a member of online groups since...well, a long, long time ago...way back when they had the first "talkers" from one of the universities in Michigan, which was basically a precursor to a chat room. It was natural for me to look to the online world for support, inspiration, and information when I began to make my own jewelry. Since that time, again, a long time ago, I have been a member of many different online group, both through sites like Etsy and informally organized, as well as a frequent member on many online forums. One thing I always found disappointing, and I thought maybe it was just a side effect of too many emotional creative types trying to communicate through text only, was that there were always those few who seemed to delight from tearing other artists down. You know, those mean girls who never quite grew up? The ones that hid behind the, "sorry, I'm just a blunt person" excuse? Yeah; insert rolling eye emoticon here. This is why I am so happy to devote a blog post to the fact that I have found myself immersed in a group of extremely creative jewelry artists, who are all warm, supporting, and encouraging beyond belief! I have blogged already about the Bead Soup Blog Hop that Lori Andersen has organized, and in which I am participating during August. But Lori also set up a Facebook group, where all members of the Blog Hop could interact and get to know each other on a more personal level. Here, I have finally found a truly nurturing online environment for my creative soul. If someone asks a question, it's answered without people being made to feel foolish. If someone asks about a technique, people are offering help readily--no one is huffing and puffing that techniques should not be shared with the competition. If someone shows work they have completed, people quickly note what they like about the piece, so we can all learn what works. I think there are way too few places like this, both online and in real life these days. I will be enjoying the next month, where I get to interact with these talented folks, and build my repertoire of skills...and be inspired to new levels! This week, I am relaxing in Las Vegas, for a much-needed vacation from reality, so I may be slow to approve comments, or get back to you... Someone needs to be watching the pool! Yesterday I shared the portion of Bead Soup that I sent to my Bead Soup Blog Hop partner, Menka. Today, I am thrilled to share what I received from Menka, to nourish my creative soul! 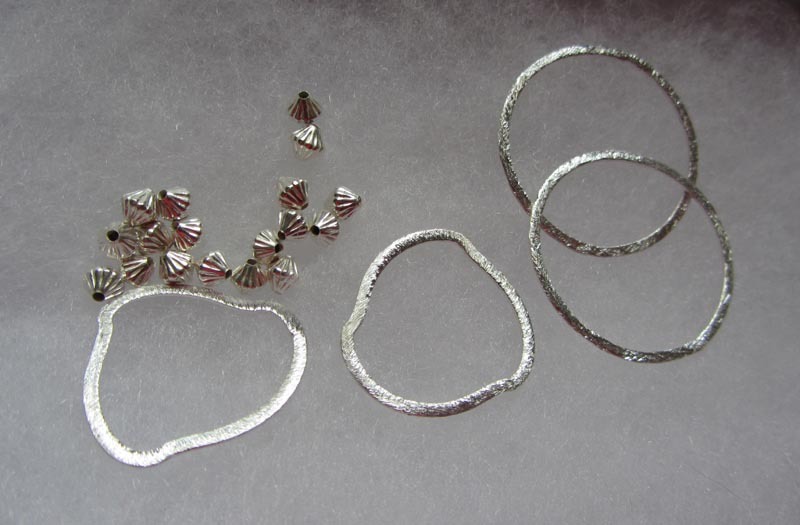 Finally, some way cool silver links and silver bicone beads! The ideas are already brewing...I love the green as the main hue--it's a color I like, but don't have a lot of in my stash, so it's forcing me to really think! My reveal date isn't until August, so I will have lots of time to play! Well, soup for my Bead Soup partner, Menka! It's one of my handmade lampwork focals and spacers, some labradorite, small grey glass pearls, and crystals. The toggle is a silver Swarovski toggle, because sparkles make me happy. Hopefully, they will inspire Menka to make something beautiful! Tonight I will be taking pictures of the soup that Menka sent to me, and should have it posted tomorrow! My wheels are already turning, thinking of all of the cool things I can make! I've been selling my handmade beads and jewelry online, off and on, since 2002. I think. Well, whatever the exact date, it's been a long time! During that time, my biggest struggle has been with making sure my photographs are up to snuff. Jewelry and beads are items that are way easier to sell in person, where people can touch and see the sparkle and nuances of colors that make an item spectacular. Your photographs have to try desperately to capture as much of the detail and beauty as possible. 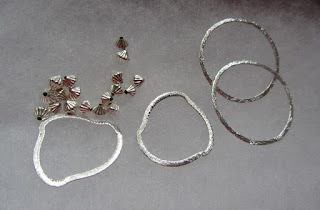 Anyone who has sold jewelry online will probably tell you, it's not easy! Not horrible, but not really professional, either. See how the harsh shadows disappear? And I didn't even attempt to tweak the color or light levels in Photoshop. What you see is a raw photograph--the only thing I did was crop it. Both were taken with the same point and shoot digital camera. I still want to tweak my set-up a bit. I'd like to diffuse the light a bit more, so that you don't get any glare, but I'm not sure if that's a realistic wish when photographing glass! But I love how I don't have to manipulate the photo, and yet it still shows the colors as true. So what do you think? Am I getting excited over nothing? What else needs to be tweaked? I am always looking for suggestions for bettering my presentation, so comments and critiques are welcome!